Poor Ohio and Kentucky. The hits keep on coming. Delta Air Lines is expected to move more aircraft to the Pacific Northwest to handle service to Asia as it continues to shuffle the departure points for its international flying to adjust its network to demand. 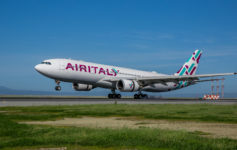 The world’s biggest airline told pilots last week that its Boeing 767ER crew base at the Cincinnati airport will likely close sometime in 2010, barring a change in network strategy. A company memo and a memo from union representatives to members does not make clear how that might affect Delta’s service from that airport to Paris, the only international destination outside of North America that Delta currently serves nonstop from Cincinnati. Thankfully, it sounds like the Delta pilots will be re-assigned to other regions, but Cincinatti will likely continue to lose flights. That potentially means 225 well-paid pilots and their families will no longer be pumping money into Ohio or Northern Kentucky’s economy. I predict CVG will be de-hubbed by the end of the year. The Cincinnati airport remains a Delta hub, but service there has been significantly cut in recent years. By January, Delta was expected to cut its daily departures at Cincinnati/Northern Kentucky International Airport to 190, down from 480 in 2001. The memo from the Delta official to pilots says Delta’s current daily departures from Cincinnati number roughly 165-175. The number of passengers using the Cincinnati airport dropped to 13.6 million in 2008 from 21.1 million in 1998. ATL, JFK, MSP, DTW, MEM, LGA (soon), SLC, NRT, and AMS seems like more than enough hubs to me. In fact, I think MEM will also not survive 2011 as a hub. Who can blame Delta for trying to cut costs and realign their operations in a way most conducive to making a profit? Next Article East Coast Storm May Lead to VDBs on United…I Want In! CLE will follow CVG as well IMO, although it might take a merger before it full goes away. While I do think CLE will diminish, I’m not sure it will completely go away. There is still a fair bit of O&D traffic out of CLE. If anything, I imagine CLE will end up being what IND was for NW, a focus city.